The Cloud Revolver is solid gaming headset, but its price lands it above most of the market's current offerings. Kingston's Cloud series of headsets have always been strong performers, bringing gamers rich audio quality at a great price. The HyperX Cloud Revolver, the company's third iteration of its rock-solid Cloud series headphone line, builds on the legacy of stellar audio quality but decidedly eschews a reasonable sticker price to match its more premium feel. For reference, the Cloud Revolver comes in at $120 (£90, AU$162), whereas Kingston's previous effort, the Cloud II, gave gamers 7.1 surround cans for just $99 (£75, AU$134) – an unbelievable value considering that many of its rivals' headsets start at twice that amount. Thankfully, however, the price isn't the Revolver's only noteworthy aspect. 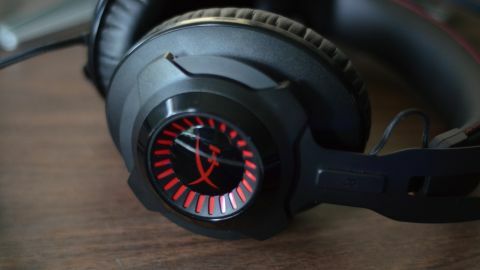 The Cloud Revolver is a sleek black and red headset. The top of the bridge is flanked by a matte black steel support frame, which gives it a premium feel in the hand. Beneath the metal frame lies a soft and comfortable headband along with two memory foam earcups. It's decidedly lacking in crazy RGB lights – you won't find any insane gimmicks or marketing ploys here. Kingston's Cloud Revolver is simple, functional and practical. Aside from the color scheme, the body of headset is well put together, durable, and somewhat modular. The headband and the other components are held in place with phillips screws, so replacing a component on the headset is effortless. I also like that the cord is a sturdy braided mesh, so it likely won't fray over time, and the fully modular microphone that can be unplugged from the base of the left earcup. It's a rock-solid design … but not perfect. There's one slight flaw. The headset has earcups that stay rigid in place, which makes them hard to take with you on the go. I have a pair of Audio Technica ATH-M50s that allow me to flip the earcups into the headband that takes up less space in my backpack or bag. As much as we hate to admit it, gaming is more mobile than ever and taking your gear to a friend's place or using the same headset for mobile phones is important to a vast swath of the PC gaming community. The Cloud Revolver performs admirably when it comes to sound quality. The bass is thick and pronounced and the mids and highs are crystal clear. The headset's angled 50mm drivers are slightly tilted so that sound hits the entire inside of your ear. There's also a bit of passive noise cancellation going on thanks to the padding that blocks out noise extremely well. Sometimes performance comes at the cost of comfort, but that wasn't the case here – I was able to game and listen to music without the headset causing any discomfort. That, in part, has to do with its miniature stature (it weighs in at just 360g or 12.69 oz), and its exceptional weight distribution, making the Cloud Revolver excellent for anyone into marathon gaming binges. The microphone performs extremely well, sounding much better than the mic offered on Steelseries Siberia V3 headset, which sounds tinnier than the Cloud Revolver. The directional mic picks up only the person wearing the headset and does a great job of blocking out background noise. It should be mentioned that the mic is rather large, however, so we are happy that Cloud Revolver has a modular one – if you don't want to use it, you can easily remove it from the left cup. The Cloud Revolver is a solid headset, providing crisp mids and highs and punchy bass on top of a svelte, comfortable set of earpads. Its only real knocks are that its rigid metal frame make it less portable and tough to fit into satchels or bags, and its price. While the former is forgivable, the latter issue isn't quite as easily overlooked. The headset faces fierce competition it receives from other lower-priced cans. Right now the Cloud Revolver sits at $120 (£90, AU$162), which makes them almost twice as expensive as the SteelSeries Siberia V3, which is currently selling for $62 online. The $120 price tag is another tough sell when you compare this headset to the last gen offering from Kingston the HyperX Cloud II. The Cloud II gives you 7.1 Surround Sound, a feature absent from the Cloud Revolver's spec sheet, and the Cloud II currently has a street price of around $90. If the Cloud Revolver were just $20 cheaper, this would be an easy recommendation. But, sadly, its price lands it in a crowded market where there are many less expensive, high-quality offerings to choose from.